Opening Ceremony designers Carol Lim and Humberto Leon have always preferred to go beyond a typical runway show. In lieu of a standard catwalk, they've presented their collections as stage plays, pageants, drag spectaculars. This season, Lunar New Year happened to fall during fashion week, and so the designers decided to celebrate with a truly massive party. OC parties are the stuff of fashion week lore. They're one of the few brands left — maybe the only one, besides Alexander Wang — who can really throw a rager. Last night's event, christened "Pig Out" in honor of the Year of the Pig, was rendered on the same enormous scale as other Opening Ceremony blowouts, like their takeovers of Penn Station and Webster Hall. 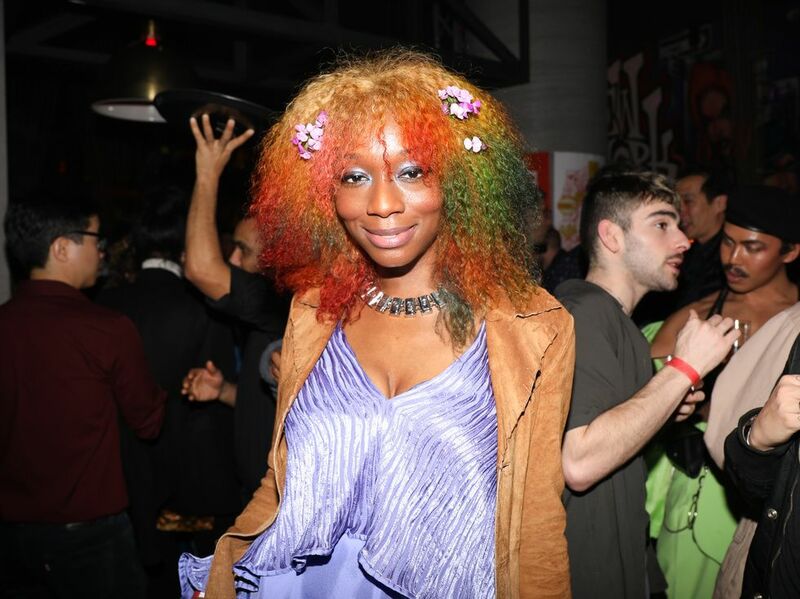 Guests like Justin Theroux, Broad City's Abbi Jacobson, Rosario Dawson, Junglepussy, and Petra Collins turned out for Lim and Leon's takeover of the Hotel 50 Bowery in Chinatown, which included separate floors dedicated to party collectives Club Glam, Bubble_T, and Gush. Burgeoning sensation Yaeji played a set of her moody electronic music around 1 AM. There was even a booth selling merch from downtown stalwart Pearl River Mart, and a mini H-Mart where you could buy party snacks. I took a giant box of Pocky home. "We've always been people who really enjoy culture, particularly music and going out and dancing, and I think nightlife, more than ever, shows self-expression," said Leon at a dinner ahead of the main event. "We're seeing three of my favorite parties come together. All of these Asian-run parties are so fun." Leon and Lim showcased their new collection in a lookbook (styled by Club Glam's Kyle Luu) cast entirely with friends and members of their community, including legendary fashion designer Anna Sui, influential electronic musician Ryuichi Sakamoto, Russian Doll actress Greta Lee, To All The Boys I've Loved Before author Jenny Han, and the founders of all last night's parties. The fluffy, covetable clothes were inspired by Hong Kong pop stars Anita Mui and Leslie Cheung, who Leon loved as a kid. "We've always been really good about being out of the box in terms of what we do," he said. "And we've always been clear that we think you can see fashion in many different ways. I think tonight is all about celebrating a community." Check out the latest collection, below.